Norway’s low-fare airline Norwegian Air has attracted more than four times the number of complaints from passengers as its arch rival Scandinavian Airlines (SAS). Those filed with the state commission handling transport complaints soared last year, and continue to outpace complaints against SAS so far this year. “We clearly have room for improvement here,” admitted Norwegian Air spokesman Lasse Sandaker-Nielsen to newspaper Dagens Næringsliv (DN) on Monday, when DN‘s story on the figures dominated its front page. Most of the complaints filed with the commission (Transportklage-nemnda for flyreiser) involved flight delays and cancellations. It also emerged that more than one in four of Norwegian Air’s flights do not operate in accordance with published schedules. 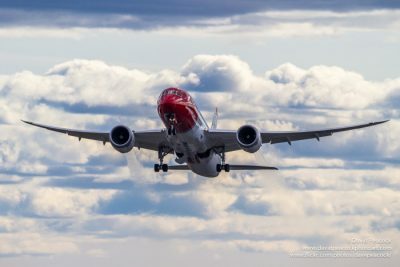 Most of the delays and cancellations involve Norwegian Air’s international flights: Its domestic service within Norway operated with a better on-time record, according to the statistics reported by DN. Many of those filed last year (when official complaints against Norwegian soared from 50 in 2016 to 305) were tied to Norwegian’s failure to provide enough pilots to staff all the flights that Norwegian had scheduled at the beginning of the summer holidays. Thousands of passengers who had bought tickets were left stranded at the airport, mostly at Oslo’s main airport at Gardermoen, and they were furious. When passengers don’t feel they’ve received sufficient assistance or compensation from an airline, they can then complain to the commission. It backed the passengers’ complaints in 69 cases last year. Among Norwegian’s problems was a flight from Stavanger to Las Palmas in November 2016 that had a damaged wheel and ended up delayed by seven hours. When passengers failed to receive satisfactory compensation from Norwegian, they appealed to the commission last year for relief, with it recommending that Norwegian at least pay out the standard compensation of EUR 400, or around NOK 4,000 per person. “We had a series of challenges last summer that led to several lengthy delays and cancellations, and therefore also an increase in complaints,” Sandaker-Nielsen confirmed. He insisted, however, that the airline follows EU regulations regarding passengers’ rights for compensation. He claims Norwegian paid out “several hundred million kroner” last year to passengers affected by major delays and cancellations. That indicates actual complaints were much higher than those reflected in the numbers filed with the commission. Last year it handled a total of 2,714 cases, according to DN, up by more than 600 from 2016. The commission’s secretariat reported that many of those also are resolved through settlements between the airline and the unhappy passenger. Members of the commission itself come from Norway’s national consumer council (Forbrukerrådet) and travel industry companies. While Norwegian attracted more than 300 complaints last year, those filed against SAS amounted to 66, down from 77 the year before when it was hit by a strike by Swedish pilots. Norwegian has already been hit by another 61 complaints filed with the commission this year, compared to 36 filed against SAS. Norwegian Air itself noted when it released passenger statistics on Friday that it “used 98.4 percent of its capacity, of which 72.3 percent was on time.” That means 27.7 percent of Norwegian Air’s flights were delayed or cancelled. SAS’ flight delays are rising, according to numbers supplied by the website Flightstats. SAS ranked as one of the world’s most punctual airlines as late as 2014, but new numbers indicate that 25.5 percent of its flights were delayed in February. An airline official attributed much of those delays, though, to weather problems in a winter with unusual amounts of snow and sub-freezing temperatures in Scandinavia and Europe.